I fully admit, sometimes my imagination gets the best of me. It's a habitual defense mechanism for navigating the world as a Black woman to do all the assuming for anyone who can't quite figure me out. I think it's ridiculous that I defy many "types" for those who share my external categories, but I'm all too aware of the world I live in. A very white supremacist one that we have to consistently fight not to collude with. As a horror fan, I find myself in many horror or nerd-like social and professional settings where it appears to be that I don't fit. Ironically, those spaces where I do appear picture perfect, I couldn't feel more alone, isolated, and uncomfortable. So amongst the sea of white faces and vibrant idiosyncrasies, I am my most confident, content, and so outspoken that sometimes, I surprise my naturally introverted self. Even though in the back of my imagination, I feel eyes piercing me with curiosity as to why and how a Black woman could acquire so much pleasure from horror. There have been instances where some have actively worked to make me feel alone, isolated, and uncomfortable. I can only imagine because I challenge some sense of superiority they hold as fans themselves, that in their conceptions: no Black woman could ever know as much as I know about horror and love it as much as me. My confidence, contentment, and outspoken demeanor to some is a threat. From this extreme has been the not so harmless, harmless comment, "You don't look like a horror fan," and "I would've never have guessed," and the overall non-response posed to make me feel like a complete freak. In the thick of my impatience and slight defeat at times with these complete misunderstandings and micro-aggressions, I learned the very difficult lesson of self love and acceptance. To not supress a very intricate part of my identity. I'm tired of hiding and I'll explode if I do anymore apologizing. Writer/blogger Zena Dixon, who runs The Real Queen Of Horror site shared similar sentiments with us here in the past: I come across many people who feel that I shouldn't be a horror fan. They think it makes me "crazy" because that's what I like, while other times they feel I'm lying because I don't look like a horror fan. I had no idea that a dress code applied! There are even people who insist on challenging or quizzing me. I honestly don't mind because I love horror movies and I love talking about them. 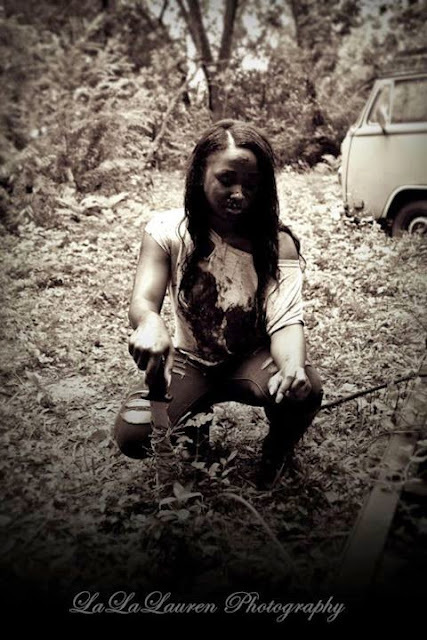 Horror fan Ternell Jade additionally shared her experiences about the times she's felt 'different' for enjoying the genre: Mostly attitudes from family, co-workers, and acquaintances like “you should have grown out of that by now” or “We” don’t do that. The “We” in the sentence referring to Black people in general, not necessarily women in specific. But, it still annoys me, because I always wonder who makes these unspoken rules. This is a problem for female horror fans across the board. But the insistence of race imprinted into this discussion is impossible to overlook. As Ternell points out, we aren't expected to have such an immense investment in the horror genre. We are expected to maybe watch a scary movie at a sleepover, maybe see theatrically released, mainstream fare and never bring that stuff home. If it sounds antiquated, it is. If you're having a hard time believing this is the conclusion some can draw from being a Black female horror fan, trust us. The most affirmed and simplest of solutions is to remain steadfast in authenticity. The past two years have punched me in the face with that lesson and I'm glad I've been through the fire of very unpleasant experiences across social and professional lines to understand that who I am as a Black woman and a horror fan are and have valuable. I have a right to be visible and be, quite frankly unfeathered by naysayers and blank stares. Latanya, Zena, Ternell, and others like them that exist deserve the same courtesy to enjoy their cultural interests and not feel as if they're exhibits or unicorns. I think the title of this post needs a shirt. Not as a gag, but an affirmation.